What sets high achievers apart from the rest of us? That’s the question Malcom Gladwell considers in his bestselling book, Outliers: The Story of Success. One intriguing answer: the 10,000 Hour Rule. Psychological research shows that people who end up at the top in any field get there as a result of one thing: they work harder than everyone else. In fact, much harder—10,000 hours harder, to be exact. That’s a good question. A great question, actually. From the standpoint of human motivation and how we choose to spend our lives, it’s the key question: What keeps someone at a task for 10,000 hours? The implications of answering that question are staggering. Given the research, if we could answer that question for any given individual, we would be well on our way to unleashing countless world-class performers in countless fields, each blissfully driven to practice, practice, practice their way to excellence—to the benefit of all of us. Think about where you work. Imagine if at your company, your school, your hospital, your place of worship, your local government, your store, wherever—imagine if even ten percent of the people who worked there were so intrinsically motivated to focus on mastering their game that their performance rose, over time, to a world-class level? How would that impact what’s going on? That is not just wishful thinking. It’s completely possible. But to get the best that a person has to offer requires knowing what motivates them. And that’s where the phenomenon of giftedness comes in—one’s inborn motivated abilities. Giftedness has to do with the fact that every human being manifests a unique pattern of motivated behavior. Every person displays (essentially from birth) a set of core strengths and natural motivation that combine to drive them to focus their energies on a particular outcome they find to be immensely satisfying. For an illustration of both giftedness and its connection to the 10,000 Hour Rule, I need look no further than my oldest daughter, Brittany. I could easily talk about my other two daughters, as well. 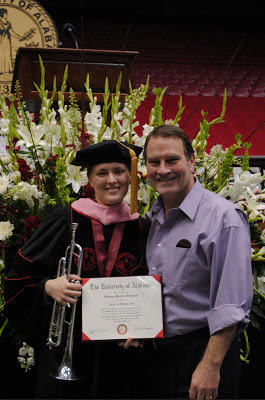 But today, I especially celebrate Brittany’s giftedness, because this past Saturday she was awarded her doctoral degree in trumpet performance from the University of Alabama. Brittany’s achievement is only the latest in a journey that began 16 years ago when she entered fifth grade. Her school required her to join the band, the orchestra, or the choir. She chose the band. Four instruments were offered: trumpet, trombone, clarinet, or flute. Brittany reasoned that the trumpets get all the important parts, so she chose the trumpet (later developments would reveal how even this choice was a precocious display of her particular giftedness). So we rented a trumpet, the band director recommended a local trumpet instructor, and Brittany began to practice her instrument. At first, the noises she made sounded like a cow having great difficulty giving birth! But her mother and I applauded her efforts nonetheless (the giftedness of children always flourishes most when it is honored by their parents). In short order, the bleats began to form into actual tones, and the tones into tunes. Then Brittany discovered this wonderful thing they do in bands called chair contests, where two instrumentalists play the same selection of music, then the band director decides which of them has played it better. The winner gets to occupy the higher chair. Brittany loved that competition (as evidenced by the increased energy she put into her practicing whenever a chair contest loomed). She quickly learned that winning a chair contest was one of the best ways imaginable for a middle school girl to outshine a middle school boy. By sixth grade, she was already surpassing eighth-graders. By the end of sixth grade, she was first chair. And it went on: practice, practice, practice. I could give you a thousand other examples of Brittany’s giftedness expressing itself through her love affair with the trumpet. Suffice it to say that by the time she was a junior in high school, she had made up her mind that she wanted to become a professional trumpet player. How could I possibly argue with that—me being Mr. Giftedness, who had spent years telling people to honor their inborn wiring?! And so Brittany auditioned for and won a spot in the trumpet studio at Northwestern University, where she studied under Barbara Butler. During her junior year, I went to Evanston to hear Brittany play a recital. I was simply stunned! I thought she was a pretty good trumpet player when she had gone off to college, but the performance I heard that night was way beyond anything I could have imagined. Right about that same time, I came across Malcolm Gladwell’s book, and read about the 10,000 Hour Rule. So I did the math. I figured that Brittany had practiced an average of two to three hours a day since fifth grade (trumpet players, like gymnasts, are training a set of muscles, so they are limited to four hours of practice a day, lest they injure themselves; Brittany would have practiced more if she could have). I knew there had been occasional days off for camps or sickness or whatever —though in Brittany’s case, there were precious few of those. Count in concerts and recitals and lessons and what not. Sure enough, it all totaled up to around 10,000 hours! And sure enough, Brittany was indeed on the threshold of being a world-class trumpet player. She could make her trumpets (plural: she had obtained about five of them by then) do pretty much whatever she wanted them to do. Best of all, she loved to play the trumpet! That was important, because just because a person has ability (or talent) in a given area doesn’t mean they have any motivation for that area. Giftedness involves both. And let me point out that giftedness is not about what you do, but how you do whatever you do. In Brittany's case, her giftedness is not about playing the trumpet, but about living into a conceptually rich role with so much mastery and finesse that she makes a huge impact on others. Playing (and especially teaching) the trumpet happens to be an ideal fit for that kind of motivation. But Brittany could just as easily have expressed her giftedness through medicine, writing fiction, acting, or many other fields. Regardless of which one she picked, she would still have had to practice like the dickens if she wanted to get good at it, because giftedness alone does not qualify a person to perform at a world-class level. It just arms them with the raw stuff needed to compete at that level. They still have to train and develop that stuff over time. Excellence is never just handed to anyone. It certainly wasn’t just handed to Brittany. She had to go after it—which she did with relentless determination. Needless to say, when Brittany announced that she was planning to go on for her master’s degree, that made all the sense in the world to me. Was she going to be able to earn a living playing the trumpet? I still didn’t know (and neither did she)! But I knew one thing: there was no way she would ever be able to earn a living playing the trumpet unless she stayed the course and got the education and training required to do that. So I encouraged her to adopt the philosophy: keep going until the light turns red. Well, through some amazing twists of fate and Providence, the light did indeed turn red. But not the red of a stoplight, rather, the pulsating red of the Crimson Tide! Brittany was invited—and paid a stipend—to become the graduate trumpet instructor at Alabama’s School of Music. Part of the package included a Doctor of Musical Arts degree. Brittany diligently taught her classes and students, worked her way through her required courses, papers, and projects, played her final recital, and wrote her dissertation. And, as always, she practiced, practiced, practiced. Then, on the same Thursday in April as the NFL draft, she received a call from the dean of the School of Music at Ball State University in Muncie, Indiana, where she was a finalist to become the school’s next trumpet professor. He told her they wanted to offer her the job. So, after all these years—and all those hours of practicing—Dr. Brittany Hendricks will take over the trumpet studio at Ball State in August. Yes, I am obviously (and unapologetically) a very proud father. But I could tell you about any number of people like Brittany—people who have applied themselves to something for 10,000 hours and ended up at the world-class level. Let me be clear: world-class doesn’t necessarily translate into great wealth. If that’s your game, there are easier ways to get there than practicing for 10,000 hours. But then, the point of life is not really about getting rich. It’s about making a contribution to the world by using whatever God-given giftedness you possess. Some people grace the world with their music. Others with their wisdom. Others with their words. Others with their ability to exercise judgment. Others with their uncanny knack for influence and persuasion. Others through the quiet but profound effect of their encouragement. Others by their patient but persistent way of helping others learn. I could go on and on. The point is, everyone has something this world needs. What is that something for you? If you will take pains to clarify what that thing is, and then devote your energies and priorities to actively and intentionally practicing that thing over time—specifically over 10,000 hours of time—you will arrive at the world-class level (whatever “world-class” happens to mean for your gift). So I appeal to you to discover your giftedness, and then practice it—whether you get paid to do it or not. Naturally, if you can get paid to do it, so much the better. But please don’t leave the gift on the shelf just because there doesn’t seem to be any money in it. You may protest, “Bill, I don’t have the discipline to do anything for 10,000 hours.” But I insist that you do, because giftedness is not about discipline, it’s about motivation. When you’re doing something that genuinely motivates you, “discipline” isn’t really a problem. Oh yes, laziness, distractions, and simple lack of character will come into play. But in my experience, when someone is really leaning into their giftedness, doing so has a way of focusing their energy such that they have neither the time nor the interest in getting sidetracked. In the end, it all comes down to what you choose to focus your life on and pour your energy into. You’re going to spend 10,000 hours on something. Wouldn’t you rather focus that time and energy on something intentional, something that fits you, and something that will end up making a world-class contribution? Believe it or not, the rest of us are longing for you to do that, because we desperately need what you have to offer. Trust me, it's right there inside of you. And like the soaring, triumphant blast of the trumpet at the crescendo of a symphony, we can hardly wait for you to express it! If you’d like to learn more about Dr. Brittany Hendricks, visit her websites at BrittanyHendricks.com and TrumpetPedagogyProject.com. Question: What illustrations of the 10,000 Hour Rule can you share with the rest of us? NEXT POST ON BillHendricks.net: Why Do People Need Coaching?